A chalazion is a cyst in the eyelid that is caused by inflammation of a blocked oil gland. They are usually painless, but tend to demonstrate redness, swelling and mild discomfort. They usually disappear on their own after several days or weeks, but sometimes, treatment is necessary. 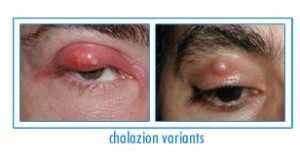 The most common manifestation of a chalazion is swelling of the eyelid. Frequently, redness will develop and may become severe if the oil gland becomes infected. The swelling can spread to the entire eyelid, typically causing some tearing, and eventually will begin to involve the eye. In this case, the infection can become sight-threatening and very dangerous. The primary treatment is application of warm compresses for 10 – 20 minutes at least four times a day. This may soften the oils that are blocking the duct and promote drainage and healing. Warm compresses may be applied with a towel. Sometimes taking a long hot shower and allowing the water to hit the eyelid is helpful. Topical antibiotic eye drops and ointments are sometimes used to treat the initial infection, but they are of little value in treating a lesion which has been present for more than several days. Usually, a chalazion will disappear without further treatment in a few weeks. If chalazia continue to enlarge or fail to disappear within an acceptable time frame, then medical treatment is necessary. Injection of the lesion with a steroid medication is one of the best options. Sometimes oral antibiotics are used to treat lesions, particularly when there is an infection present. Treatment with oral or intraveneous antibiotics is necessary if the infection has begun to spread and encompass the whole eyelid, the eye, or deeper structures of the face. Surgical excision is sometimes performed. This involves an office procedure in which local anesthesia is injected into the skin around the lesion, and not into the eye. The lesion can then be drained and removed by making a small incision on the inside of the eyelid. Removal of the chalazion can usually be accomplished without the need to place sutures, therefore eliminating a scar. Healing after surgical excision is rapid and the patient usually returns to normal activity within one or two days. A large chalazion can cause astigmatism due to pressure on the cornea. This will cause blurred vision and irritation of the eye. The astigmatism tends to resolve when the chalazion is removed. In some people, recurring chalazia are a problem. There are various treatments that can be implemented in order to reduce the risk of recurrence. Proper cleansing of the eyelid may prevent recurrences in people who are prone to chalazia. Cleaning of the eye lashes with medicated eye pads often helps to reduce clogging of the ducts. Who Can Help Me to Treat My Chalazion? Most doctors are familiar with the basic treatment of chalazia, which includes warm compresses and the application of eye drops and ophthalmic ointment. However, as a Manhattan ophthalmic plastic surgeon Dr. Brazzo, is has received additional training as both an ophthalmologist and plastic surgeon. He has treated thousands of people who have disorders of the eyelid, particularly NYC chalazia patients. He will be able to advise you on the best treatment to remove the chalazion. To learn more about chalazion removal or to schedule a consultation with Dr. Brazzo, please contact our New York City office by calling (212) 355-2215 today.